Cardboard Junkie: I found my Wiener! I've spent most of my spare time this weekend trying to get boxes and piles and mess of cards in my office somewhat more organized This was partly due to a mild cardboard disaster I had earlier this week. So here's the deal. I have a large desk that fits in a corner that I use for most of my card/drawing/web surfing/watchin' ponies/doing actual work stuff. It's not a small desk and when I moved it in, it was a pain to get it pushed flush against the wall so I was lazy and left a gap between the desk and the wall. So of course, cards, books, pencils, boxes, cups, papers, packages, headphones, boxes of tea, wolverines, atom bombs, holy grails, Justin Bieber etc. regularly commit suicide and jump into the gap. This requires me to pull out the file cabinet drawers I have under the desk and crawl about on the floor to rescue objects on a regular basis. Justin can fend for himself. On Monday, one of the packages I had planned to mail took a flying leap into the abyss. I could see the bloody thing mocking me behind the desk so I decided to try reaching behind to snag it. Dumped an entire 800-count box of 'important' cards in the process. Idiot = me. I ended up having to pull out the file cabinet and crawl about like a dog anyway, just with a lot more mess. But, while I was down there I did manage to get my hands on my wiener. 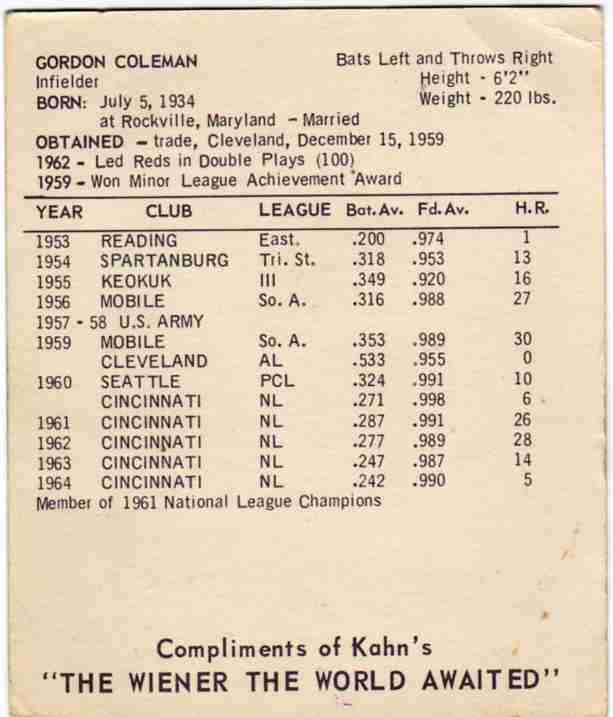 Here's Gordon Coleman from the 1965 Kahn's Wieners set. In a previous cardboard catastrophe some oddball cards went over the wall and Gordie here never came back. I honestly had forgotten I even had this card. 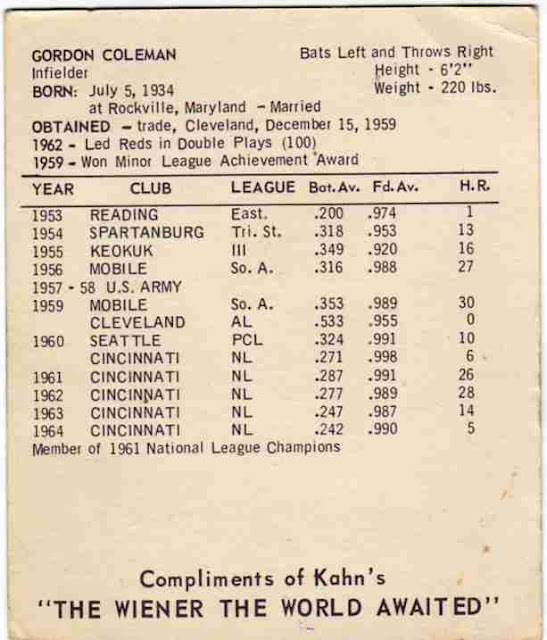 The Kahn's cards are little larger than a standard sized card at 3 9/16" by 3" and featured cards from the Red, Indians, Pirates and Braves. Kahn's is one of the more prolific regional vintage sets as they produced cards for 15 years from 1955-1969 before later hopping back on the baseball gravy train in the late '80s. The color photo and full bleed borders look quite nice for a mid-60's oddball. I also love the ads on the outfield wall even though I don't love their recent resurgence in the majors. The backs are fairly Spartan with no card number and limited stats, but it does have the classic "THE WIENER THE WORLD AWAITED" slogan in bold caps. 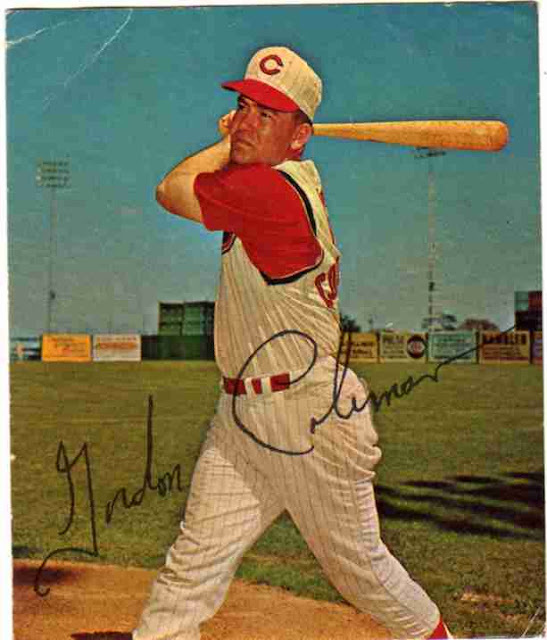 Did Cincinnati really win the pennant in 1961? By gum, they did. My memory is totally shot. Interesting stuff in the stats list. Keokuk is really fun to say. Seeing Seattle as a Pacific Coast team is neat too. When's the last time you saw a line on a stat list where a season was missed due to military service? That's not a rhetorical question... no one's been drafted in decades, there has to be a 'last card' where a player actually has that line on the back. Find it before I do and take all the glory! 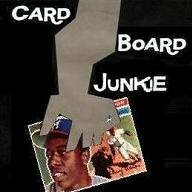 (plus I'm lazy) Like most of my random vintage oddball cards I picked this up off of eBay for a couple of bucks. I will gleefully trade it for a comparable vintage oddball Brave. Hear that, Red fans? Your Gordie awaits! Interesting Back stats. I like the simply approach but never seen it presented that way. I can haz Bryce Harper rookie card? Happy 29th Birthday Chipper Jones!